Sunrise Pottery offers pottery lessons on the potters wheel for the whole family. 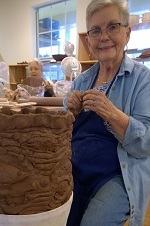 Doug Oian, potter since 1975, instructs beginners, intermediate, and advanced students. Class times are fexible and group sessions are offered. Sunrise Pottery also offers handcrafted Texas-Designed pottery for everyday use. 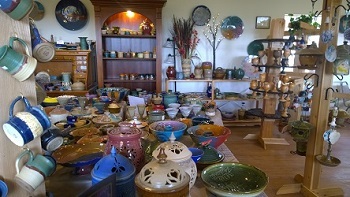 Sunrise Pottery is a wonderful hand thrown, stoneware pottery store and classroom. Clay Artist Doug Oian creates a wide variety of everyday dinnerware, serving pieces, and home decor as well as clocks, and music boxes. Doug makes custom orders with your ranch brands, and native American Pictograph designs on anything. Everything can be used in the microwave, freezer, dishwasher and oven and all of the pottery is made with safe and natural ingredients that contain no lead. Cups for ACTS retreats or reunions are available including custom names and dates on the cups. We ship anywhere and each item is insured. This is a one day class offered one Sunday a month. It includes all materials and you will make a large coil pot. You will also come back and glaze it which is included in the price of the workshop. The class is 10am to 5pm and Doug is an excellent instructor. Each class is limited to 7 students. Call Doug for dates available 210.494.8633 Call now, 210.494.8633 space is limited. Change the energy of your home, office and business with these pottery Rods and Pendulums. They come complete with instructions so you can neutralize the effect of stuck energy as well as receive Yes and No answers to your questions. Wearing the hidden crystal pendant will also keep that good energy with you all day. Platters custom designed for any special occasion. Lots of designs and color combinations. Order 6 weeks in advance.